The past couple of days have been exciting for the next generation of American players. Shelly Licorish cheered on Floridian, Sloan Stephens. She reached the US Open Junior Semis and lost a tough match by losing a third set tiebreaker. She won the doubles title with Tsmia Babos, which they are also reigning French and Wimbledon Junior Doubles Champions. Congratulations Sloane, we are very proud of your accomplishments! Late 2009,we hit an exciting milestone for our association by reaching 50,000 members. 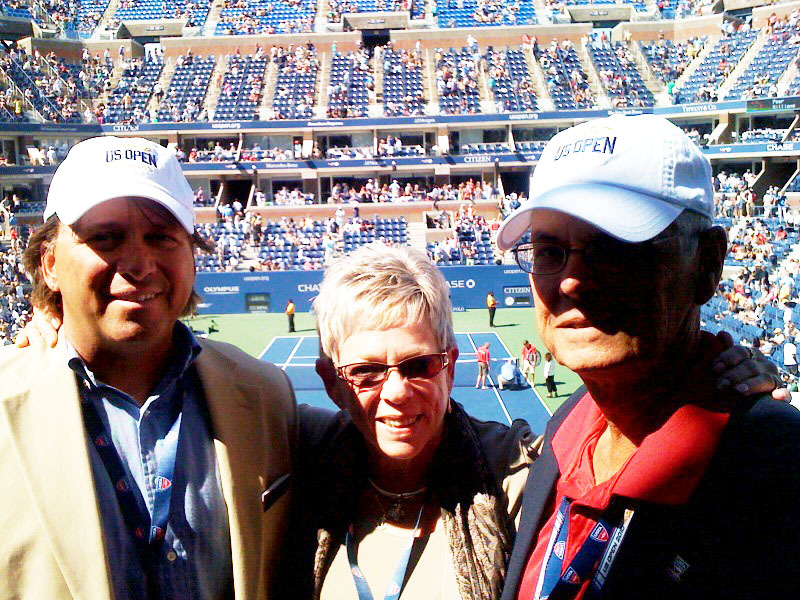 To honor this special milestone, we awarded the 50,000th member a trip to the US Open. 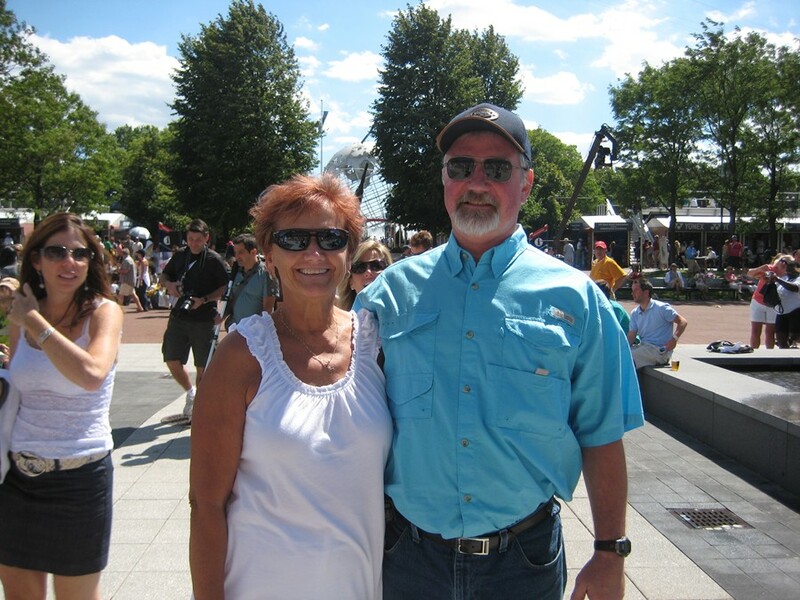 The lucky winner was Marsha Adams of Tallahasse, Florida. 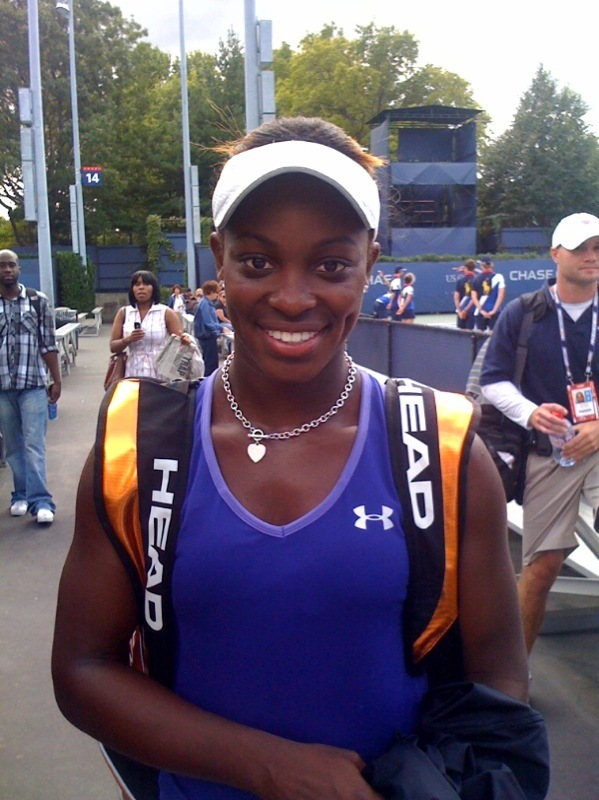 She and her husband received tickets for two to the 2010 US Open, in addition to airfare and two nights hotel accommodations in New York. The prize could not go to a more deserving tennis player. 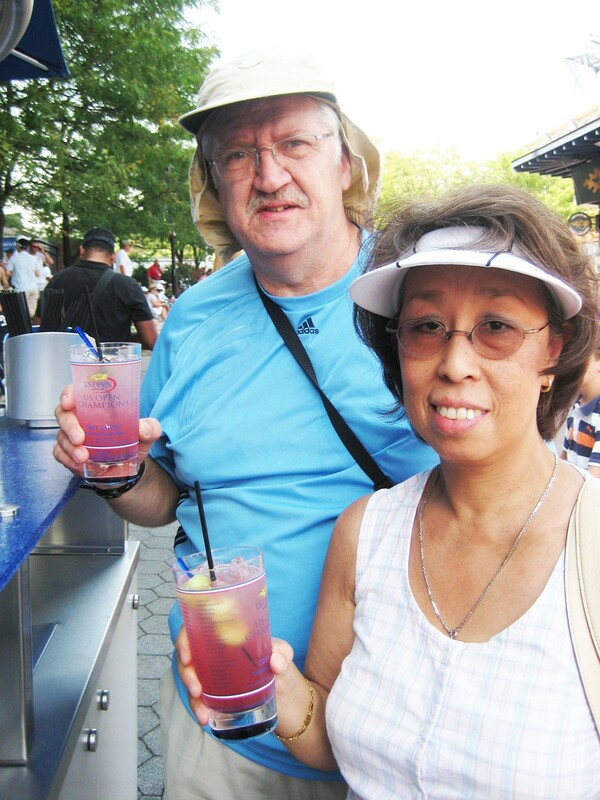 Marsha Adams (left, pictured with her husband) is USTA Florida's 50,000th Member and won a trip to the US Open. Today continued with several committee meetings. We heard very exciting news during the Membership Committee meeting, which there will be an iPhone application available later this year for USTA League players. The application will help team stats, update scores and assist captains with their needs. We believe this will be extremely useful for our USTA League players and we cannot wait to download it! 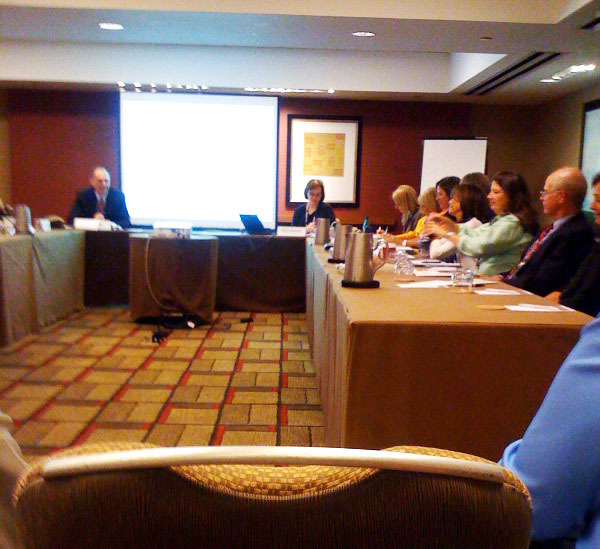 Trina Singian attends the Membership Committee meeting during the USTA Semi-Annual Meeting. The Semi-Annual Meeting started today. The big topic of discussion was QuickStart. The USTA announced that it has passed new rules governing competition for 10-and-under tennis tournaments. The new rules require that 10-and-under tournaments be played using slower-moving and lower-bouncing balls, on smaller courts and utilizing shorter, lighter racquets. It will apply to all USTA-sanctioned events for children 10-and-under. QuickStart seemed to be the topic in every session and meeting. The opening session on Saturday featured Lucy Garvin, where she talked about her term as the USTA President/Chairman of the Board and received a standing ovation from the crowd. Her theme during her term was TEAMWORK, One Team, One Goal. Patrick McEnroe, Kurt Kamperman and Gordon Smith talk about QuickStart during Sunday's morning session at the USTA Semi-Annual Conference. After a great two days of meetings, USTA Florida Board and staff enjoyed a day session of matches. We were treated to three exciting matches in the President's Box: Kim Clijsters vs Ana Ivanovic, Venus Williams vs Shahar Peer and Rafael Nadal vs Gilles Simon. It was a gorgeous day to watch matches and to enjoy the sport we all dearly love. It is Membership Appreciation Day! It is a time where we can honor our wonderful members. Members enjoyed a special hospitality area and received free gifts, snacks, entertainment, pictures with the US Open trophy and special appearances! Davis Cup Captain and ESPN commentator Patrick McEnroe stopped by from 11:30 a.m.-12:30 p.m. to chat with fans and autograph copies of his book, "Hardcourt Confidential". 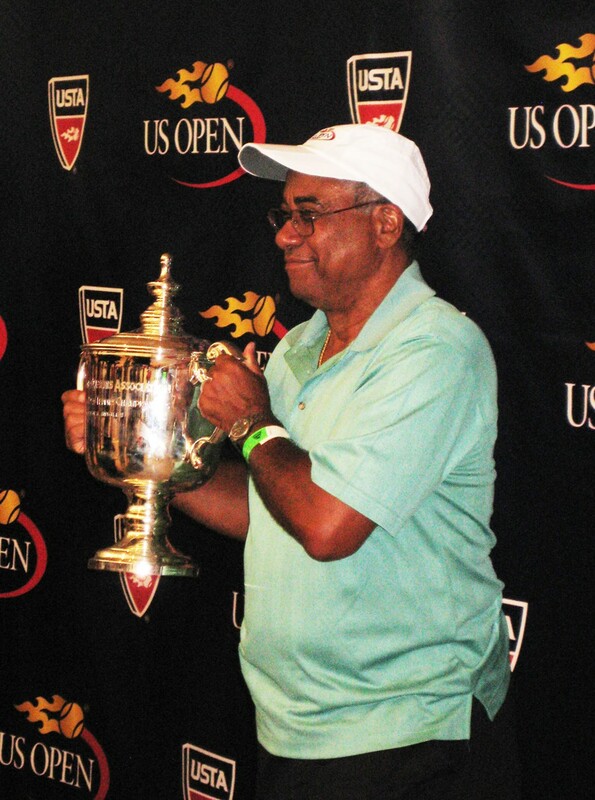 Many members were filmed to talk about their love for the game and USTA. Membership Appreciation Day was a great opportunity to show our members how much we care and to give thanks for their support. Shots from Membership Appreciation Day. 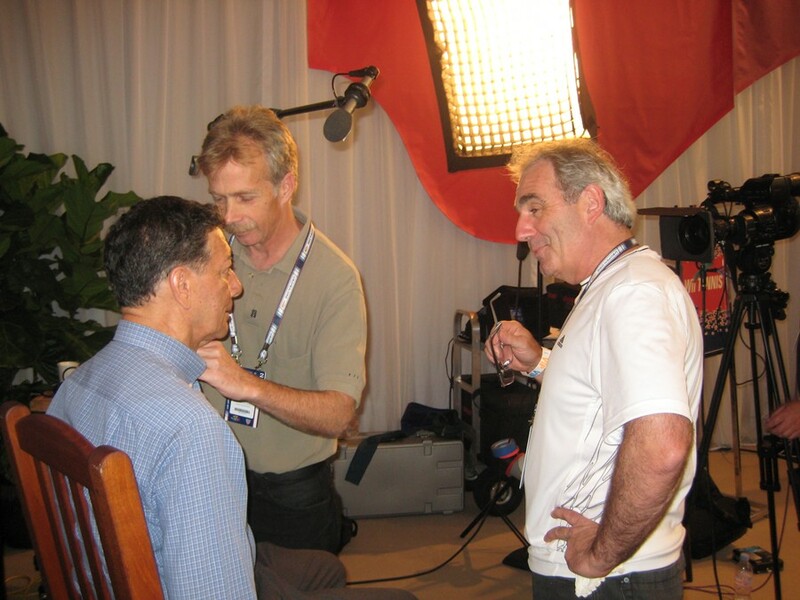 Member being interviewed (left), Wii Tennis (center), Photos with the US Open trophy (right). 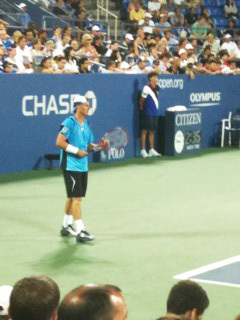 We were able to watch some night matches and enjoyed phenominal tennis. Venus cruised through her match while wearing a daring dress which was flashy enough to be on Dancing with the Stars. A crowd favorite, Rafa, won his match in straight sets. There is no better way to end a day than a night match at the Open. 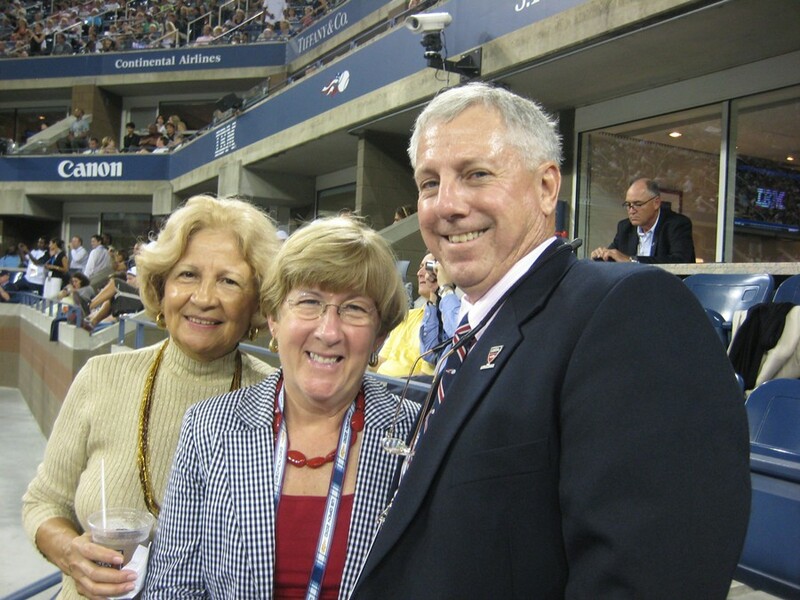 Celia Rehm, Barbara and Donn Davis enjoy tennis after a day of meetings. It was hot, hot, hot! The temperature in NY was a scorcher. Being from Florida, we were surprised that temperatures were hotter than Florida. 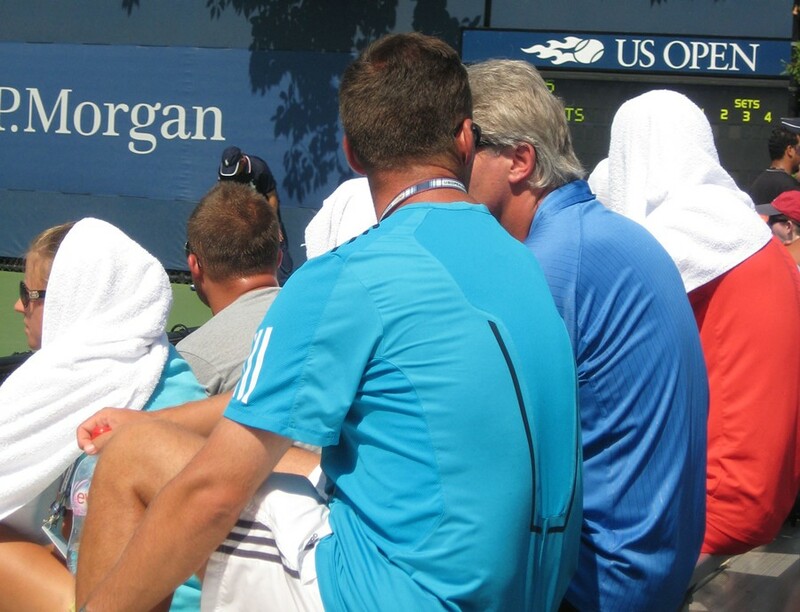 The best way for fans to deal with the heat were fans, umbrellas, towels and cocktails! Fans try to cool down by taking cover with towels and enjoying Greg Goose cocktails. 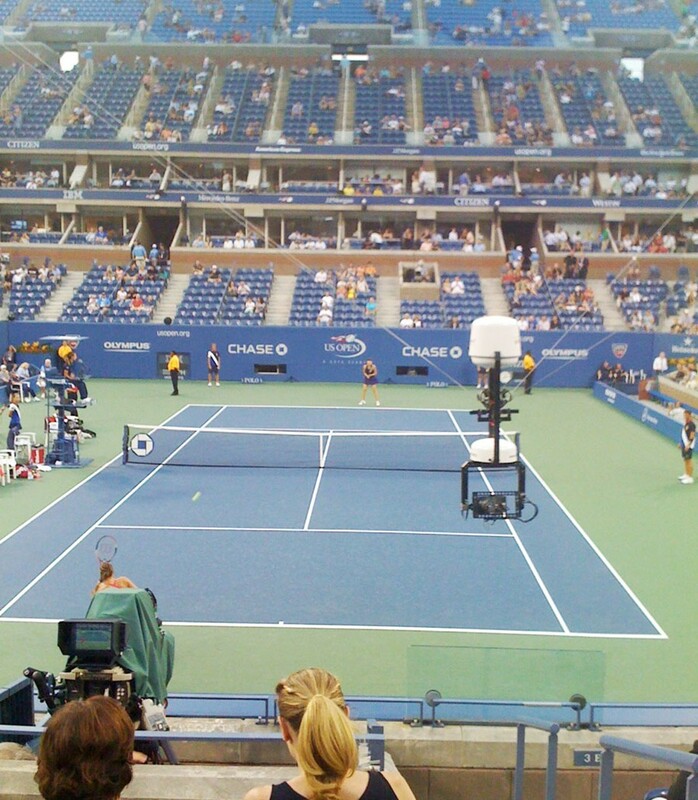 Ever wonder how the US Open gets the great bird's eye view of the court? The spidercam gives viewers a 3-D view of the action. It is a great enhancement of this year's US Open. Below is a picture of the spidercam flying through the stadium during Sharapova's match. 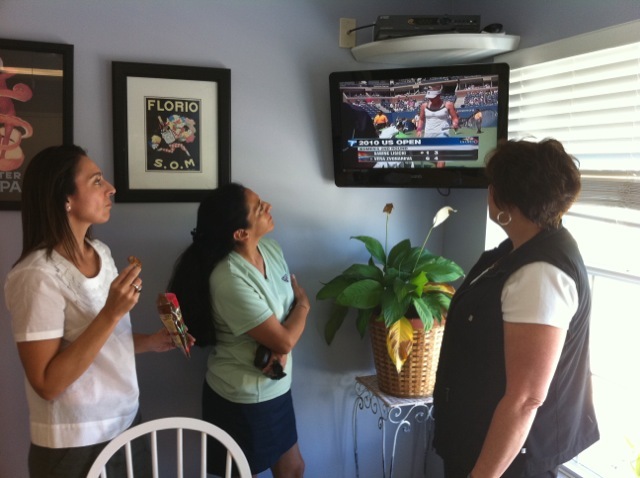 In Daytona Beach, location of USTA Florida headquarters, staff enjoy watching US Open highlights and matches in our lunchroom. Live streaming and live scores are a must on our computers! Our annual US Open bracket is underway and we take pride on who has the best picks. Everyone competes to have the coveted leader board marker at their office/cubicle. Staff check up on the scores and take a break to enjoy US Open coverage (left). 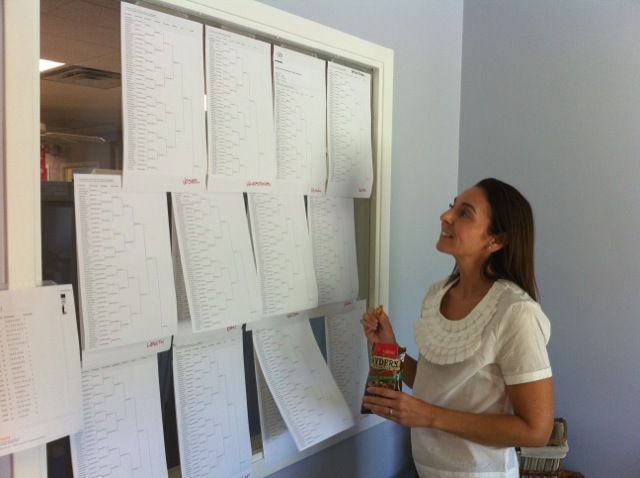 Rebecca Halpern checks out the brackets (right ). The competition in Flushing is not the only USTA tournament heating up in the New York area today. 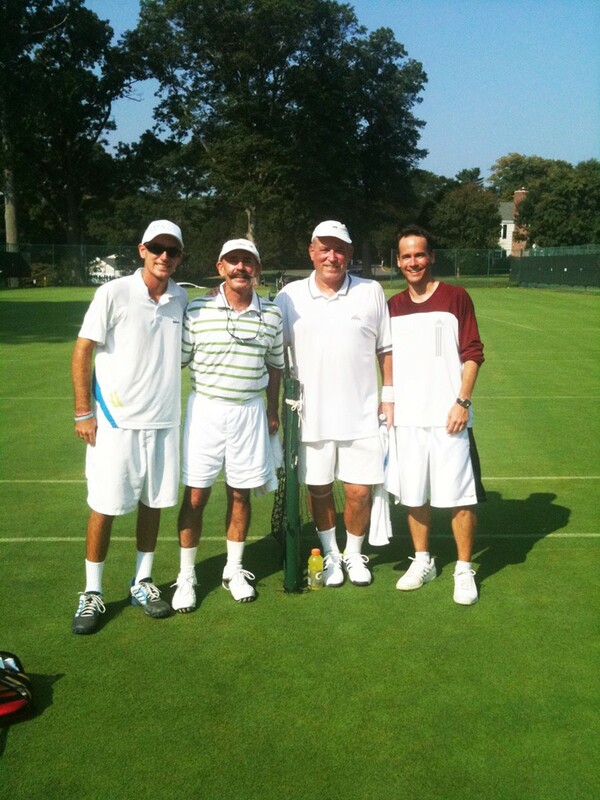 The USTA Father/Son National Grass Court Championships kicked off at the Piping Rock Club. There was a lot of Florida representation and support, which USTA Florida staffers, Michelle Willis and Ann Brown, cheered on the USTA Florida teams. Temperatures are much like Florida. Today's high in Locust Valley was forecasted to reach 94 degrees. Aaron & Dave Brown (Volusia county), Don & Casey Cleveland (Palm Beach county) at the USTA Father/Son National Grass Court Championship. 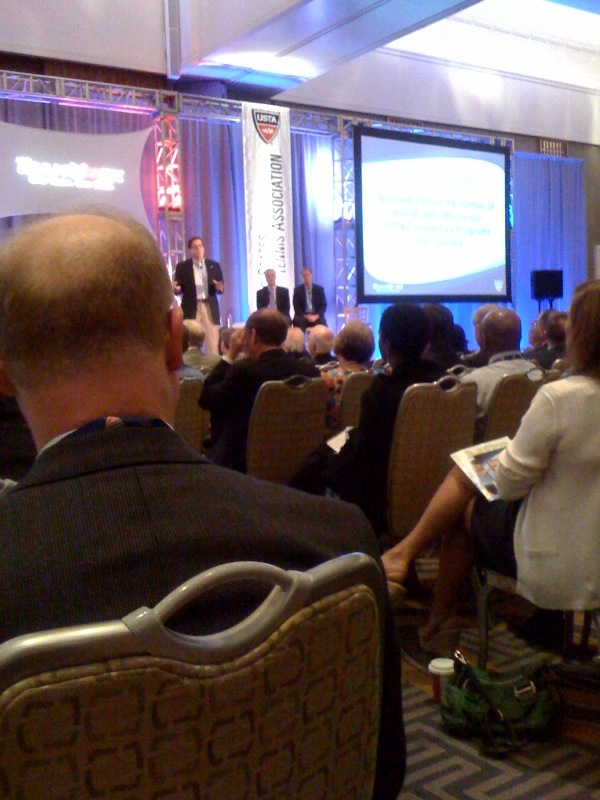 Many of USTA Florida staff and volunteers arrive today for the 2010 USTA Semi-Annual Meeting and Conference. There are many important meetings that are held throughout the Labor Day weekend. Tomorrow the USTA Board of Directors, Section Leadership, Section Executive Directors, Presidents and Delegates meet to discuss current and future plans for tennis in the U.S. The USTA Tennis Teachers Conference had many great sessions today, including Dr. Jim Loehr's Coaching Players to Win with Character. One of the great thoughts we came out with was "Achievement in it of itself is meaningless. Betterment is the purpose. Winning is a consequence not the goal". But one of our favorite sessions was Tennis as a Team Sport for 8 & Under Kids, presented by USTA Florida's Rita Gladstone. It is exciting to go into hotel ballrooms with tennis courts and QuickStart nets set up! Tennis can be played and demostrated anywhere! 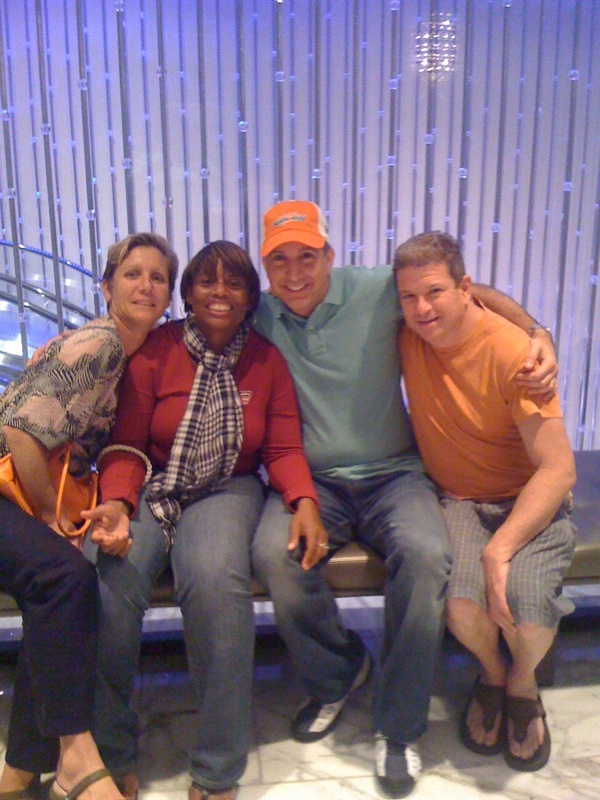 Rita Gladstone, Shelly Licorish, Mark Leider, Dede Allen and Adam Ross at the USTA Tennis Teacher Conference. We ended the night with great tennis. It is just the start of all the excitement. The shot of the night was Federer's tweener winner. Amazing! Also, it was a great day for American tennis with wins of Andy Roddick, Venus Williams, Melanie Oudin and others. Enjoy some shots from Flushing. Martina Navratilova speaks at the Opening Night speaking about tennis and attitude gets her through all challenges in life. USTA Florida's Michelle Willis shares her view at Louis Armstrong Stadium (watching Lleyton Hewitt). 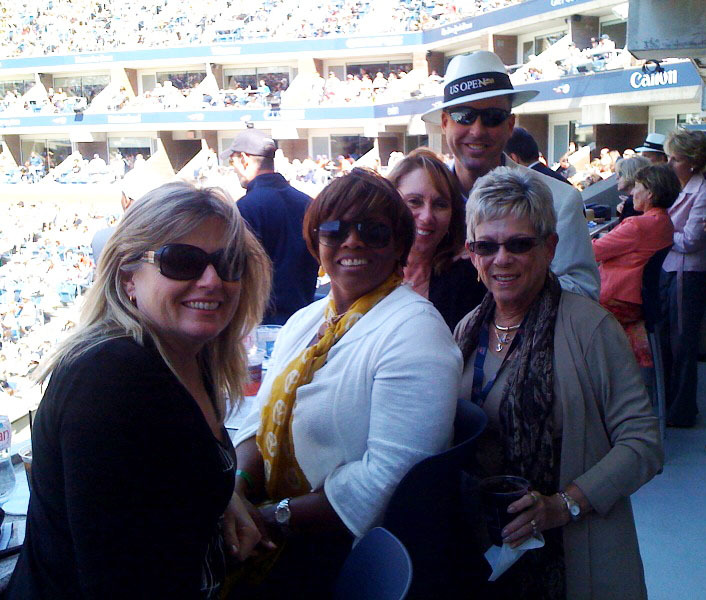 Some people may not know during the US Open there are conferences and meetings hosted by the USTA. 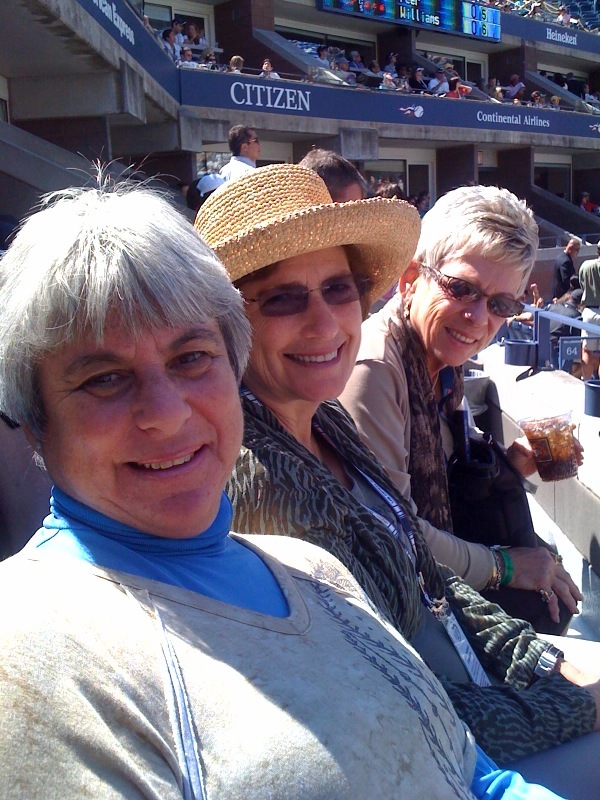 Every year many of us come to learn at the USTA Tennis Teachers Conference (TTC). The TTC brings together 500 of the world's greatest tennis teaching professionals, coaches, learning experts, and tennis innovators to share ideas and network about the changing nature of the tennis industry. This year marks the 40th anniversary for this conference. 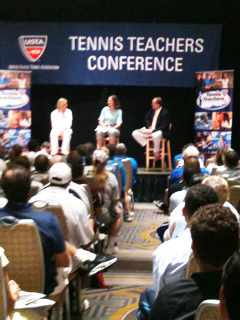 The TTC kicks off today and will be held until August 31, which has featured speakers Jim Loehr and Tracy Austin. USTA Florida's Michelle Willis attends the USTA Tennis Teachers Conference and listens to the panel of Melanie Oudin, Pam Shriver and Cliff Drysdale. We are very excited for the start of the 2010 US Open tomorrow. The Opening Night Ceremony is generating a lot of excitement. This year's theme is Dream, Succeed and Inspire. The night will feature tributes to tennis greats Martina Navratilova and James Blake, wheelchair tennis star Esther Vergeer and a special musical performance by award-winning performer Gloria Estefan. The countdown until the US Open is almost done and we are ready for some great tennis!!! 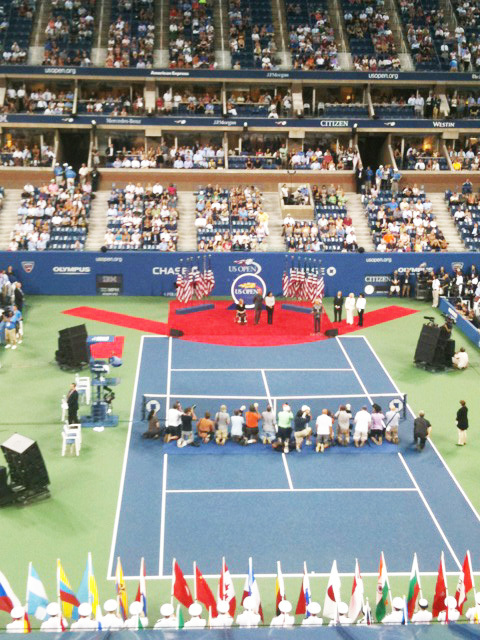 It is the largest tennis children's events, Arthur Ashe Kids Day (AAKD)! We were very excited to help with oncourt activities to get kids swinging. 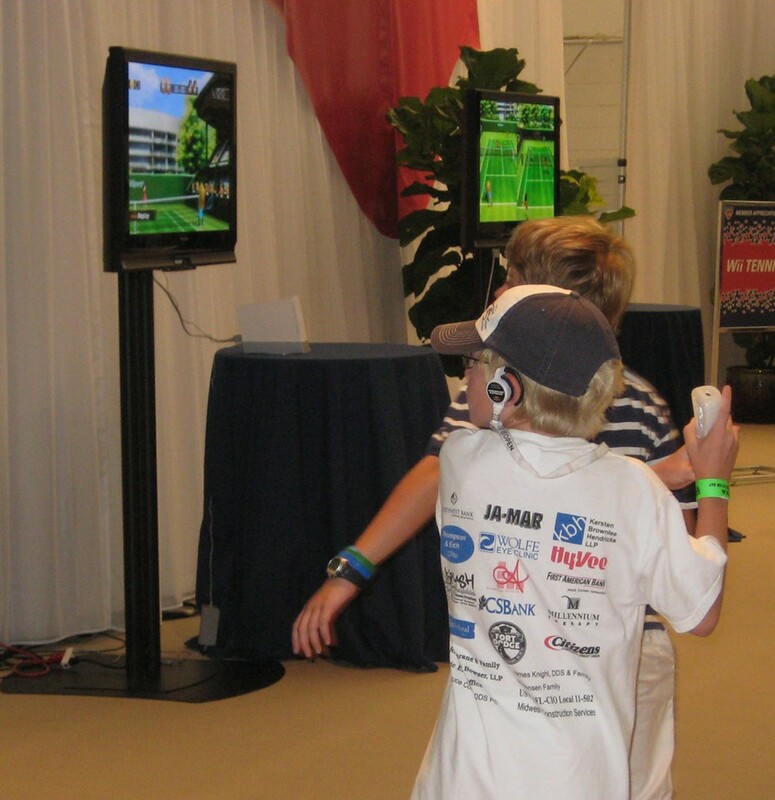 Fun activities during AAKD included Smash Zone, QuickStart Tennis, The Hess Obstacle Course, The IBM Hit the Spot!, face painting and much more. 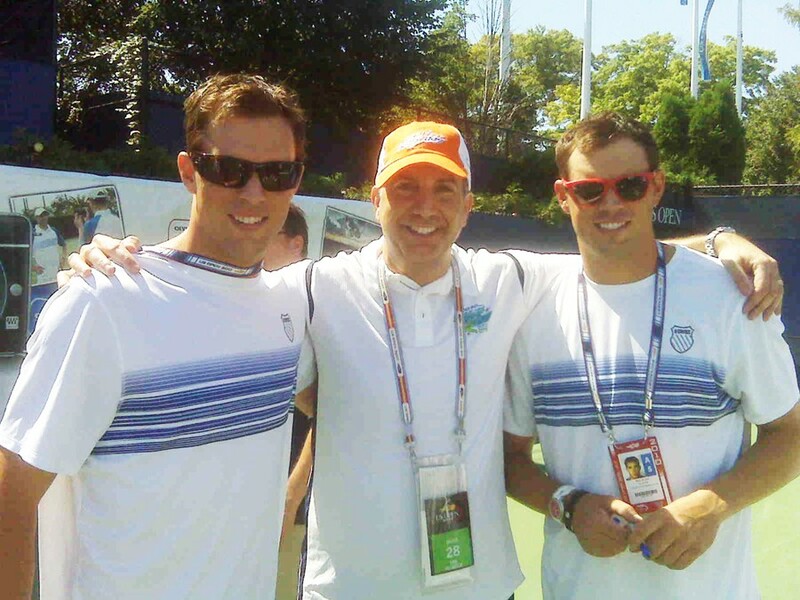 Tennis pros joined the festivities, including the Bryan Brothers. They are pictured below with USTA Florida's Adam Ross. The big show featured the Jonas Brothers, Demi Lovato, Andy Roddick, Roger Federer, Rafael Nadal, Kim Clijsters and many more. It will air on CBS Sunday, August 29 at noon (ET). 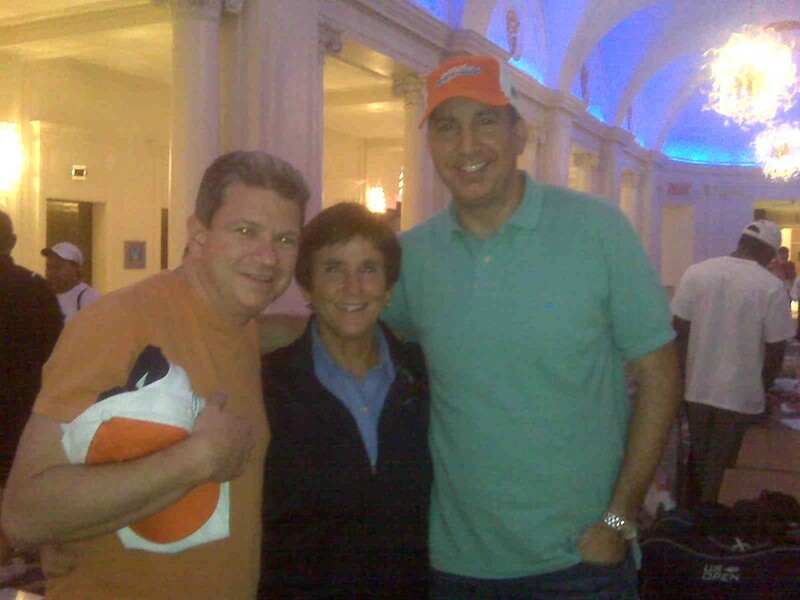 We hope you enjoy the televised show tomorrow. We enjoyed having thousands of kids throughout the day playing and watching the sport of a lifetime. Here are some pictures throughout the day. 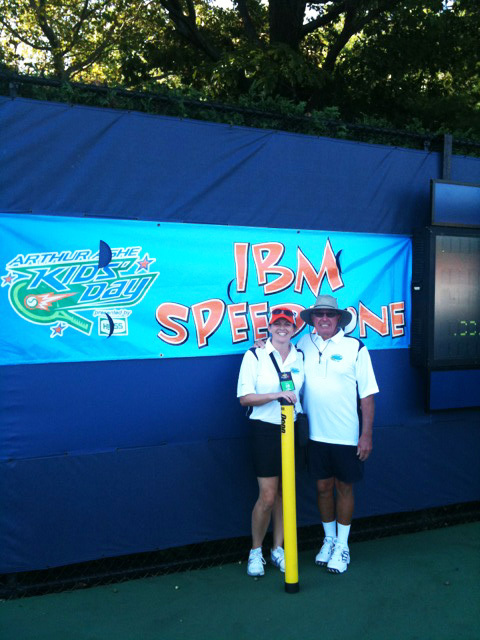 USTA Florida's Michelle Willis and Chuck Horman helping with the IBM Hit the Spot! 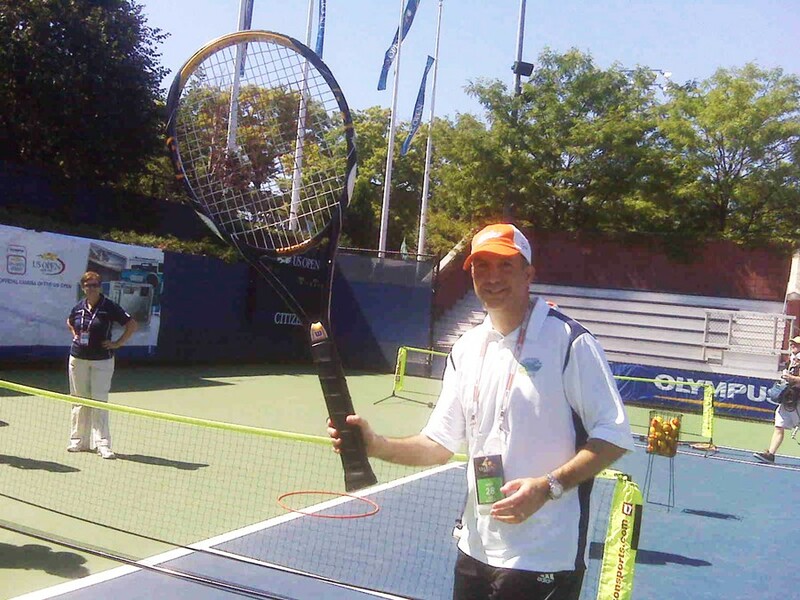 USTA Florida's Adam Ross hamming it up at the QuickStart Tennis court. 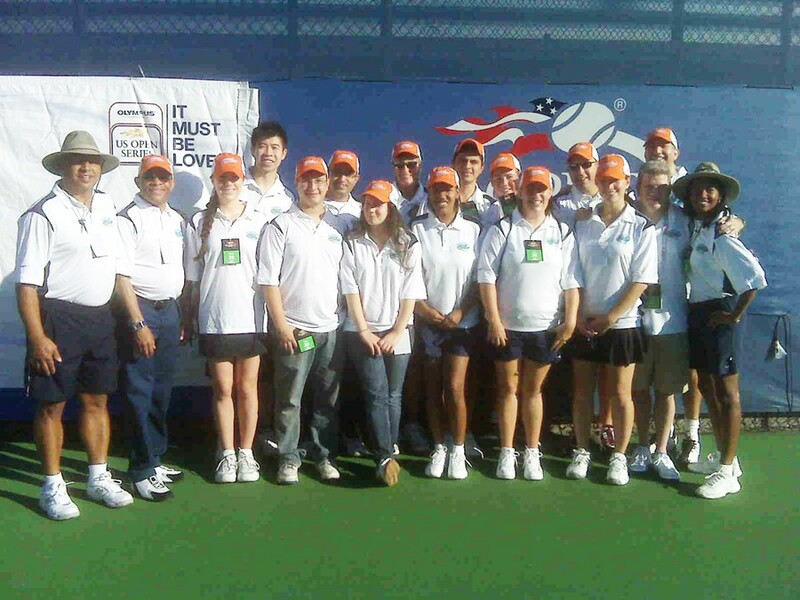 Arthur Ashe Kids Day volunteer group picture.